Vajrayana is a term describing the tantric or esoteric practices of Buddhism. The name Vajrayana means "diamond vehicle." Where practiced, Vajrayana Buddhism is an extension of Mahayana Buddhism. 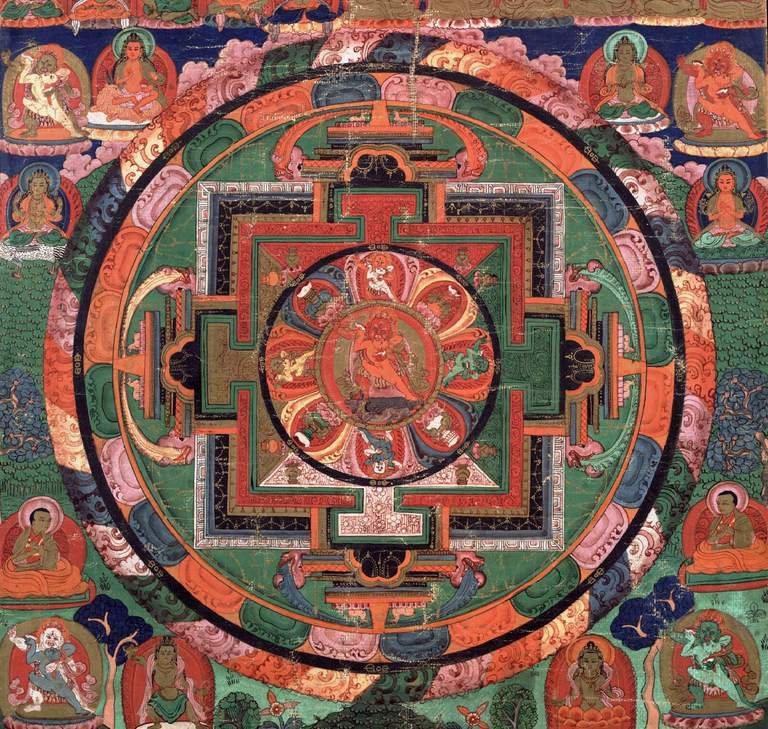 Put another way, the schools of Buddhism associated with Vajrayana -- chiefly the schools of Tibetan Buddhism as well as the Japanese school of Shingon -- are all sects of Mahayana that employ an esoteric path of tantra to realize enlightenment. Sometimes, elements of tantra are found in other Mahayana schools as well. The term Vajrayana seems to have appeared about the 8th century. The vajra, a symbol adopted form Hinduism, originally signified a thunderbolt but came to mean "diamond" for its indestructibility and its power to cut through illusions. Yana means "vehicle." Note that the name Vajrayana suggests that it is a separate vehicle from the other two "yanas," Hinayana (Theravada) and Mahayana. I don't think this view is supportable, however. This is because the schools of Buddhism that practice Vajrayana also self-identify as Mahayana. There is no living school of Buddhism that calls itself Vajrayana but not Mahayana. The word tantra is used in many Asian spiritual traditions to refer to many different things. Very broadly, it refers to the use of ritual or sacramental action to channel divine energies. In particular, in various ways, tantra uses sensual and other desire as a spiritual means. Many schools and paths of tantra have emerged over the centuries. Within Buddhism, tantra usually is a means to enlightenment through identity with tantric deities. Very broadly, the deities are archetypes of enlightenment and also of the practitioner's own fundamental nature. Through meditation, visualization, ritual, and other means, the practitioner realizes and experiences himself as a deity -- enlightenment manifested. To make this work, the student must master a series of increasingly esoteric levels of teaching and practice, usually over a period of years. The guidance of a master teacher or guru is essential; do-it-yourself tantra is a really bad idea. The esoteric nature of tantra is considered necessary because the teachings of each level can only be properly understood by someone who has mastered the previous level. A person stumbling into upper-level tantra without preparation would not only not "get" it, he might also misrepresent it to others. The secrecy is to protect both the students and the teachings. It appears that Buddhist and Hindu tantra appeared in India at about the same time. This was probably about the 6th century CE, although some aspects of it date to as early as the 2nd century CE. By the 8th century, Buddhist tantra had become a large and influential movement in India. For a time monks practicing tantra and monks who did not live together in the same monasteries and followed the same Vinaya. Tantra was also being taught and practiced in the Buddhist universities of India. About this time, a series of tantric masters such as the legendary Padmasambhava (8th century) began to carry tantra directly from India into Tibet. Tantric masters from India were also teaching in China in the 8th century, establishing a school called Mi-tsung, or "school of secrets." In 804, the Japanese monk Kukai (774-835) visited China and studied in the Mi-tsung school. Kukai took these teachings and practices back to Japan to establish Shingon. Mi-tsung itself was wiped out in China after the Emperor ordered a suppression of Buddhism, beginning in 842. Elements of esoteric Buddhism lived on in east Asia, in spite of this. From the 9th through 12th centuries in India, a group of maha-siddhas, or "great adepts," began traveling around India. They performed tantric rituals (often of a sexual nature, with consorts) and probably acted as shamans as well. These siddhas -- traditionally 84 in number -- were not connected to a Buddhist monastic tradition. Nevertheless, they based their teachings on Mahayana philosophy. They played a huge role in the development of Vajrayana and are revered today in Tibetan Buddhism. The final significant phase of Vajrayana in India was the development of the Kalachakra tantra in the 11th century. This very advanced tantric path is an important part of Tibetan Buddhism today, although other tantras are practiced in Tibetan Buddhism also. Buddhism in India had been in decline for some time by then and was virtually wiped out by invasions in the 13th century. Much of Vajrayana is built upon a kind of synthesis of the Madhyamika and Yogacara schools of Mahayana philosophy. The Sunyata and Two Truths doctrines are critically important. At the highest tantric levels, it is said that all dualities are dissolved. This includes the illusory duality of appearance and emptiness.